The U.S. Copyright Office has publicly announced that it will not grant copyright protection to artwork created by animals. This issue gained attention recently, when photographer David Slater fought the Wikimedia Foundation regarding rights to photographs taken by monkeys on his camera. In 2011, Mr. Slater traveled to Indonesia. After coming upon some monkeys while walking through a national park, he set up his camera and walked away briefly. He returned to find that the monkeys, including the crested black macaque pictured at right, were taking photographs using his camera. 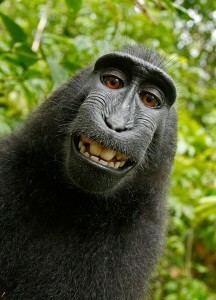 Due to the popularity of the monkey’s grin, the term “monkey selfie” was born. The photos ended up on Wikimedia Commons, and when Mr. Slater asked they be taken down, Wikimedia refused. Mr. Slater claimed he owned rights to the photographs on the basis that he owned the camera the animals used to capture the images. His logic does not necessarily jive with copyright laws. Under basic copyright principles, the author or creator of a work owns the copyright to the work unless it qualifies as a work-made-for-hire. Under that principle, the monkey would own the copyright to the photo, but obviously the law does not allow animals to own property. This monkey selfie is not a unique instance of animal artwork. The Oklahoma City Zoo has an annual fundraiser in which artwork created by its animals is sold at auction. Check out the Zoo’s Art Gone Wild event to see samples of the animals’ artwork. Zoo Miami has similarly sold paintings created by a Matschie’s Tree Kangaroo. Finally, for a gallery of other painting animals, click here (my favorite is the elephant’s painting). work. Burrow-Giles Lithographic Co. v. Sarony, 111 U.S. 53, 58 (1884). state that the work was inspired by a divine spirit. • A photograph taken by a monkey. • A mural painted by an elephant. • A claim based on the appearance of actual animal skin. intervention from a human author. • Reducing or enlarging the size of a preexisting work of authorship. dictated by manufacturing or materials requirements. transferring a motion picture from VHS to DVD. converting a sound recording from monaural to stereo sound. • Transposing a song from B major to C major. resonance imaging, or other diagnostic equipment. The lesson for those of us who don’t face the risk of wild monkeys grabbing our cameras: Artwork created by our pets is in the public domain.